I love how my friend Andrew is once again spreading the good word about eating real food through his annual October Unprocessed challenge! I think it’s imperative for people to know that eating right doesn’t have to be complicated, and more importantly (except for during this challenge, of course) it doesn’t have to be all or nothing. 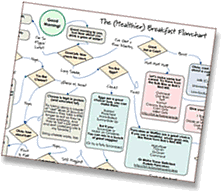 As I learned during my own “100 Days of Real Food” pledge, living by a set of rules for a brief period is enlightening and allows you to gain a new (and often, much-needed) perspective. But I also soon found that following strict rules for life just isn’t for me because – let’s face it – stress never did anybody any good either! Taking my own challenge back in 2010 basically forced me to come up with alternatives for things I was relying on like daily white chocolate mochas made with highly processed powder, dessert after almost every meal, fruit snacks and goldfish for the kids, and white bread for sandwiches (oh yes, I did). Then after our pledge was over we decided what “rules” we wanted to adopt long-term (turns out most of the changes were here to stay), and where we wanted to make exceptions as needed (usually at restaurants and traveling, just for convenience sake). So as you near the end of your own challenge, I encourage you to think about what unprocessed rules will soon become your own “new normal.” This isn’t exactly a fad diet after all, it’s a new and improved lifestyle that you’ll (hopefully) agree is here to stay! And with that I’d love to share a super-easy real food recipe with you from my brand new #1 New York Times Best-Selling cookbook, 100 Days of Real Food How We Did It, What We Learned, and 100 Easy, Wholesome Recipes Your Family Will Love. Enjoy! These biscuits are so easy my nine-year-old can make them by herself! Biscuits are a great addition to breakfast or dinner, and if you bake extra they freeze beautifully for another day. So leave behind the canned dough versions made with refined flour, refined sugar, and partially hydrogenated oil (i.e., trans fat). Recipe from the 100 Days of Real Food Cookbook. Vegetarian & Freezer-Friendly. In a medium bowl, combine the flour, baking powder, and salt. Mix well with a whisk or a fork. Add the milk and mix together thoroughly without overmixing. Knead the dough with your hands 8 to 10 times, then turn the dough out onto a floured counter or cutting board. Pat the dough out flat with your hands until it’s about ¾ inch thick. If the dough sticks to your fingers, sprinkle a little flour on the top and bottom. If it’s too dry (not holding together), add a splash or two of milk or water. Using a cookie cutter (any shape) or upside-down drinking glass, cut out biscuit rounds. Gently press together the scrap dough and cut another biscuit or two, taking care not to over-handle the dough. Tools needed: Cookie cutter (any shape) or a drinking glass turned upside down for cutting out the biscuits, large baking sheet. 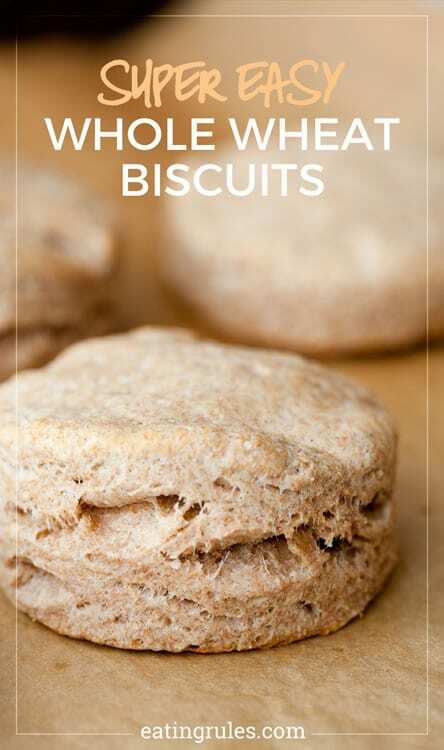 Easy Whole-Wheat Biscuits by Carrie Vitt. 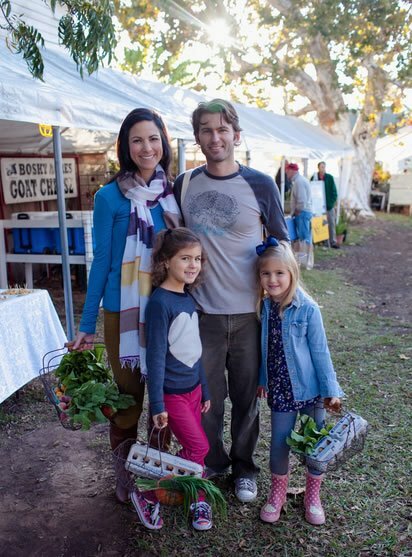 Leake Family at the Farmers Market by Kelly Trimble. You can also make these without having to use a cutter. Just pat out the dough and cut like a pie with a knife. That uses all the dough without having to reform it. Does it matter if you use skim or whole milk? I would recommend whole milk, but skim may work. This recipe seems very similar to my mother-in-law’s “hard pudding” recipe that I use all the time. Hers called for white flour but I always use whole wheat and she would bake hers in pie dish and slice. I bake mine in greased mini-muffin tins so everyone gets their own pastry easily. Thanks again Andrew, for helping all of us to eat better, and make it become our normal! 2nd year going and I love this!